Every year on Halloween we have some kind of chili for dinner. I usually use mostly red, brown, and black beans, with turkey meat, but this year I wanted to make it a festive orange color. 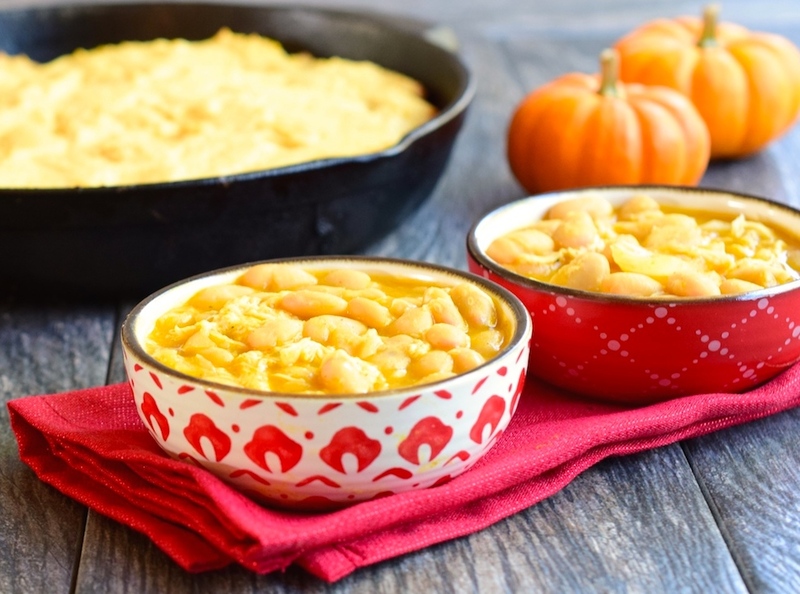 This recipe uses only white beans and chicken, so the orange from the pumpkin really pops! 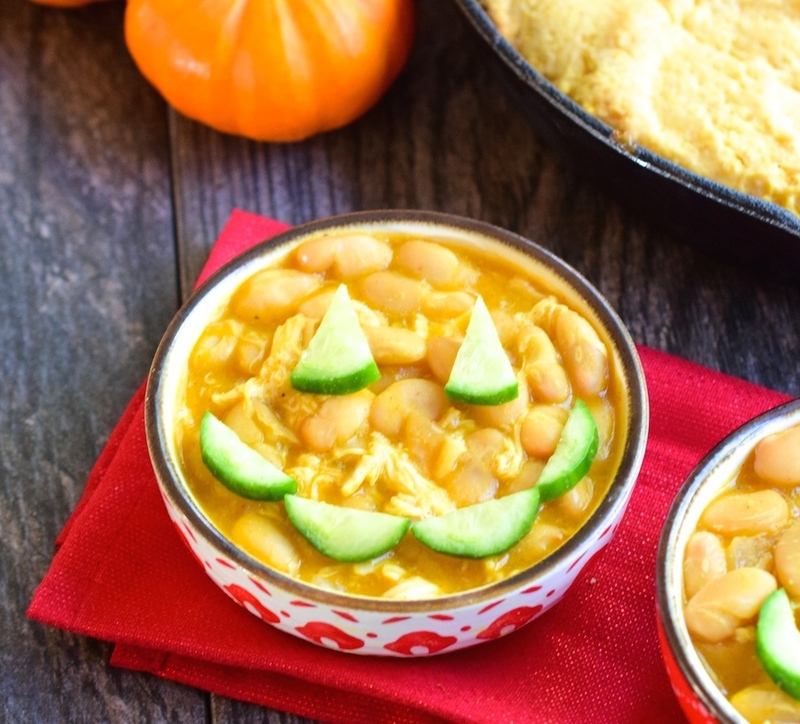 Chives criss crossed over the top, like a spider web, or cucumber cutouts to make a pumpkin face are the perfect finishing touch for this Super Easy Pumpkin Chili! It’s been a while since I’ve shared a recipe with beans in it, so let’s review some of the reasons why beans really should be included in your diet! First, they are really high in vitamins and minerals, as well as protein and fiber. They have resistant starch in them, which passes through your intestines, without being absorbed, and it feeds the beneficial bacteria that reside in there. Beans really fill you up, but you don’t not all of the calories actually get past your digestive system, so they are a great food for those trying to lose weight. Combined with the pumpkin, onions, and chicken in this chili, you really do get a complete meal in one dish! Of course, I like to add some gluten free cornbread to round it off a bit. I’ll share some ideas on how to modify packaged GF corn bread mix to make it lower carb later this week! Before we get to the recipe for the Super Easy Pumpkin Chili, I want to invite you to join with others who are making healthy changes. I’d love to walk alongside you in your journey towards wholeness and health! Jesus said, “I have come that they may have life, and have it to the full!” Freedom from food addictions is part of having a truly full life. This Spooky Pumpkin Chili is the perfect dinner for Halloween, or a cozy Fall evening! It is gluten and dairy free, and very easy to make! Sauté the onion in the coconut oil in a dutch oven over medium heat. When the onion is soft add the garlic and keep cooking for 2 more minutes. Pour the wine on top of the onions and garlic, and let it reduce for a couple of minutes. Add the remaining ingredients and stir well. Bring it to a boil, and serve hot. Enjoy! 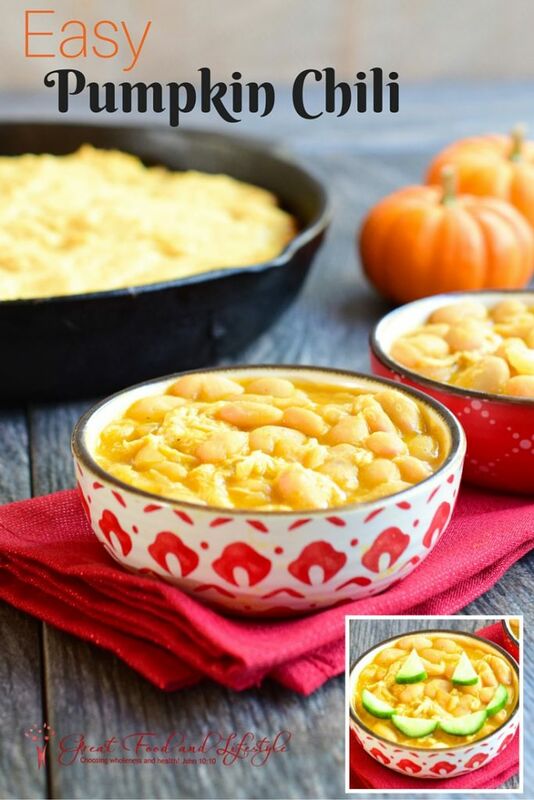 2 Responses to "Super Easy Pumpkin Chili"
i made this to eat after Trick or Treating and it was so delicious! thanks for creating a healthy alternative! Glad you liked it! Thanks for sharing!